By now you've heard that New Old Lompoc has joined the clash of local brewpubs to start distributing their beer in bottles. Look for 22-ounce bottles of Lompoc Strong Draft and C-Note IPA (pictured) on store shelves now. C-Note is my standard choice when I'm at one of the Lompoc pubs -- it's so hoppy and delicious that I can rarely bring myself to choose something else. I'm happy to report that the bottled C-Note has all the pretty flower flavor you're used to in the pubs. That was a real fear I had -- sometimes there's a vast difference between a beer's draft version and the bottle, with Bridgeport IPA showing the wildest swing I can think of. 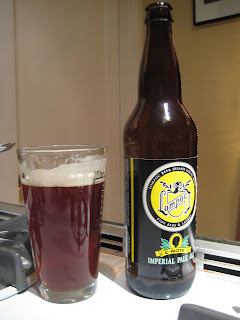 So, the bottled C-Note is tasty, and for a bomber it's a good deal: I picked up that bottle for $4. Now, happy hour price at the Hedge House is $3.25 for a pint; if Jeff Alworth is right about Lompoc using 14-ounce cheater pints, then you're coming out much cheaper buying C-Note in 22-ounce bottles. That's usually not the case with bombers: at Roots or Bridgeport your happy-hour pints are cheaper by the ounce than buying their beer in a 22-ounce bottle retail. Go figure. One other bit of Lompoc news is that their website has recently been greatly improved. It used to be a dog-slow collage of images that wasn't worth the wait. The front page got fixed up a few months ago, but until more recently the pages for the other pubs like Hedge House still had the old look. Is the 3.25$ cheater price also the Tuesday price? Hi Angelo: $3.25 is the Hedge House price I got from the website. The cheater-pint allegation is from Beervana, I haven't checked up on it myself.